How can I keep grout clean and new looking? Ceramic tile floors are beautiful, durable and easy to maintain. 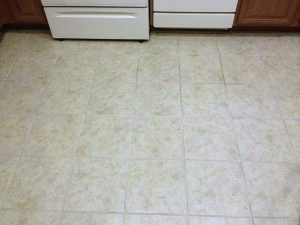 The problem with maintaining the new look of ceramic tile floors is not the tile itself but keeping the grout clean. There are a number of ways to address the maintenance of your grout but the most important thing to understand is the appropriate care for your flooring. Let’s discuss the tile floor. 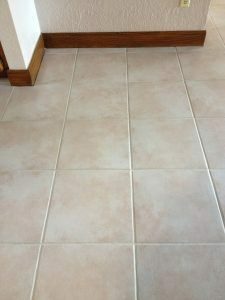 The tile is the largest surface with the grout lines slightly at below the tile. The grout line becomes a sink where the fluid runs off the tile and collects water and soil. Since grout is porous, any moisture that gets in the grout is absorbed into the grout. Since the fluid is the carrier, after the fluid evaporates what remains are the solids or stains. 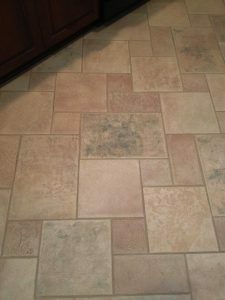 These solids or stains can build-up over time providing unsightly grout lines. With this understanding, there are things a home owner can do to help maintain the clean appearance of the grout lines. Like any other floor, dirt and material that stains are the enemy. Placing rugs or mats at entryways and high traffic areas to help capture the dirt is beneficial. 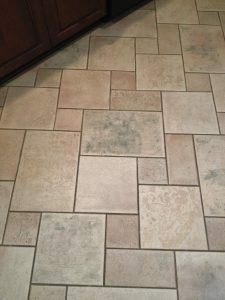 Daily living provides many other items that stain and can find their way into the grout so it best to understand how to minimize exposing your grout. Sealers are often used to help protect stone or grout from soils and stains. The intent of grout sealers are to protect the grout from spills, dirty water or stains. Sealers accomplish this one of two ways. 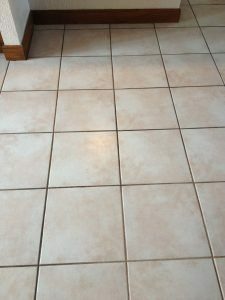 A topical sealer puts a coating on top of the grout in an attempt to prevent water and stains from penetrating the grout. An impregnating or penetrating sealer uses a carrier, of either water or solvent, to allow solids to soak into the grout to fill the pores in the porous grout and repel water and often oil. A sealer that resists water based spills is hydrophobic and a sealer that also resists oil-based soils and spills is oleophobic. The decision to seal is really dependent on what you are trying to accomplish. Some home owners choose not to seal but regularly have their floors professionally cleaned. If you choose to seal your grout with an impregnating clear sealer, read the label and apply accordingly as often reapplying is needed every 6-18 months. If you choose a quality, professionally installed topical sealer, it may last for years and is the easiest to maintain. Avoid mopping your floors in a manner that would push water into the grout lines. 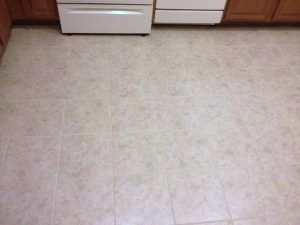 While each mopping improves the appearance of the tile, as the mopping progresses the water becomes more and more soiled. Remember, the largest surface is the tile which also collects the majority of the dust and soil. Since fluid is the carrier of the solids and stains, mopping with water would push the soil and stain into the grout. An unsealed or improperly sealed grout line would allow the water to penetrate and stains will develop over time. So with tile, not unlike other flooring, there are effective ways to care for your tile floor to provide long lasting effects. Regular floor cleaning will help minimize the opportunity for dirt to find it’s way into your grout. Always vacuum or sweep your entire tile floor thoroughly to remove all the loose dirt and dust before wet cleaning. A damp mop (swiffer type or microfiber mop) works well. Using neutral or mild cleaners are all that is necessary to effectively clean tile. Look for floor cleaners that indicate they are neutral tile floor cleaners, safe to be used for daily use. Neutral is a pH of 7. This can be applied to the tile using a spray bottle. Lightly spray the floor and let dwell about 3-4 minutes. This will allow the cleaner to begin to work. Remember to use as little water as necessary. If water does to get in the grout lines, it is best to remove it using a clean towel as soon as possible. If your grout has become heavily soiled, you can buy grout cleaners and brushes made specifically for this purpose. I do not recommend many of the home remedies found on the internet as most are ineffective and/or may cause damage to the grout or stone tile. If your grout has become soiled and stained it may be necessary to have it professional cleaned. At Beyond Clean Tile, we have invested in the latest technology designed specifically to clean hard surfaces. We use 4 components that work in harmony to clean and sanitize your tile and grout. We apply an emulsifier to safely loosen the soil then we use our specially designed trailer mounted system to produce high pressure and very hot water to agitate and flush out the loosened soil while simultaneously vacuuming/extracting the soiled solution off your floors. There is really no way of knowing the true condition of the grout until the soil has been removed. After cleaning and drying you may notice permanent staining from rust, dyes, chemical abuse or perhaps results from a lack of maintenance over the years. Maybe there were repairs made to the grout in the past or perhaps inconsistent grout color from initial install. To address these conditions, we provide a color seal solution also effective for those who just want a little different color of grout from the initial install. This Color Seal is a very effective topical sealer. Once Color Seal is applied it provides many years of consistent appearance, ease of maintenance and protection from water and oils. I have included some before and after pictures of some of my clients floors that have selected to have our color seal professionally installed. Kitchen before: Notice the picture framing of the tiles. Kitchen after clean and color seal: Notice how the grout lines complement the floor. Kitchen before: notice how grout lines stand out in traffic areas. Kitchen after clean and color seal: Notice smooth consistent color of floor. We just moved in and Beyond Clean Tile got our tile looking like we were moving into a new house. We added an additional service which involved replacing caulking in shower - again, making it look new. Jim was extremely knowledgeable and presented a zero-pressure quote. Money very well spent.